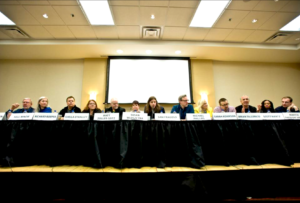 Critical Mass: The Future of Film Criticism Panel April 19, 2018 at the University of IL. 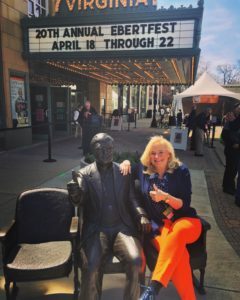 20th Anniversary Ebertfest Film Festival. 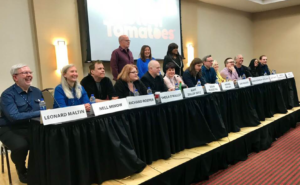 Sponsored by Rotten Tomatoes. Standing Nate Kohn, Claudia Puig, Chaz Ebert. 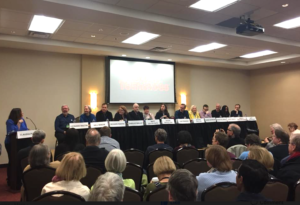 L – R seated Leonard Maltin, Nell Minow, Richard Roper, Sheila O’Malley, Matt Zoller Seitz, Susan Wloszczyna, Sam Fragoso, Michael Phillips, Sarah Knight Adamson, Brian Tallerico, Scott Mantz, ReBecca Theodore-Vachonand and Matt Fagerholm. The Virginia Theater, Champaign, Illinois. Sarah sporting the Orange and Blue colors of U. of IL where her father and grandmother attended college.